The Black Diamond Momentum 3S is billed as an entry-level harness, but fact is it’s a good all-arounder for just about anyone. Black Diamond bills the Momentum 3S as an entry-level four-season harness, but unless you are sport climbing at the highest level where the difference of a few ounces might matter to your psyche and self worth, this 13.4-ounce harness is good for anyone, doing anything. Ice climbing and hard mixed climbing being the exceptions, since the Momentum 3S lacks ice-clipper tabs or a place to attach them. Priced at just $59.95 and with adjustable leg loops, the Momentum 3S does seem to have “beginner” stamped all over it, but, really, who doesn’t want to save a few or a lot of bucks? And adjustable leg loops are the single greatest feature a harness can have for maximizing comfort. Harnesses with “fixed” leg loops rarely fit. For example, fixed leg loops typically have two inches of adjustment. If you are on the smaller end of the range the leg loops are just too large. 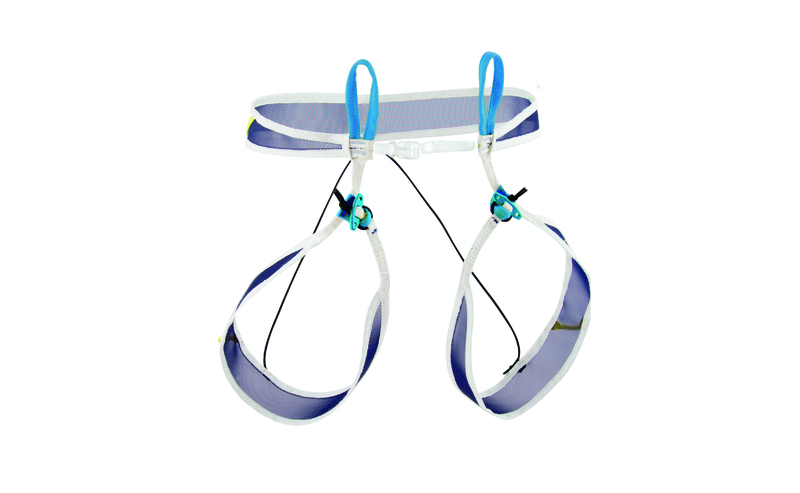 When you hang in them they slack upward, letting the waist belt ride up, pressing on your lower ribs. If you fit the leg loops so they are snug, fine, but most people size a harness for the waist belt and prefer loose leg loops, not realizing the implications. Adjustable leg loops let you cinch down the fit, which more evenly distributes the weight between them and the belt, and you can do this regardless of what you are wearing. Think of this as the difference between wearing a pair of pants that fit versus a pair that is two sizes too large and require a belt to hold them up. Adding to the comfort of the Momentum 3S is a “dual core” construction used in the waist belt. Dual core uses two strips of load-bearing webbing that are spread apart, one high and one low, with EVA foam for padding, mesh for venting and a smooth nylon sheath for next-to-skin comfort. The waist belt is pliable and about three and a half inches wide at its widest point in the small of your back. I hung in this harness for up to four hours at at time projecting and brushing and bolting, wearing just a T-shirt, and the harness did not dig in or rub me raw. Four rigid and outward-canted gear loops make clipping gear off and on as easy as it gets and are positioned in sweet spots that aren’t too far forward or too far back. These could get in your way in a squeeze chimney. Avoid squeeze chimneys. The buckles are of the double-ring design and cinch down easily and stay cinched. Releasing the waist belt buckle can be a two-handed operation that requires manually unthreading the buckle, and especially so once the webbing has gotten dirty. 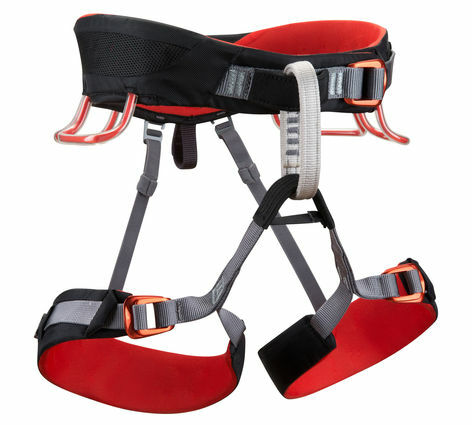 Two straps of webbing hold up the leg loops in the rear and are adjustable with difficulty. 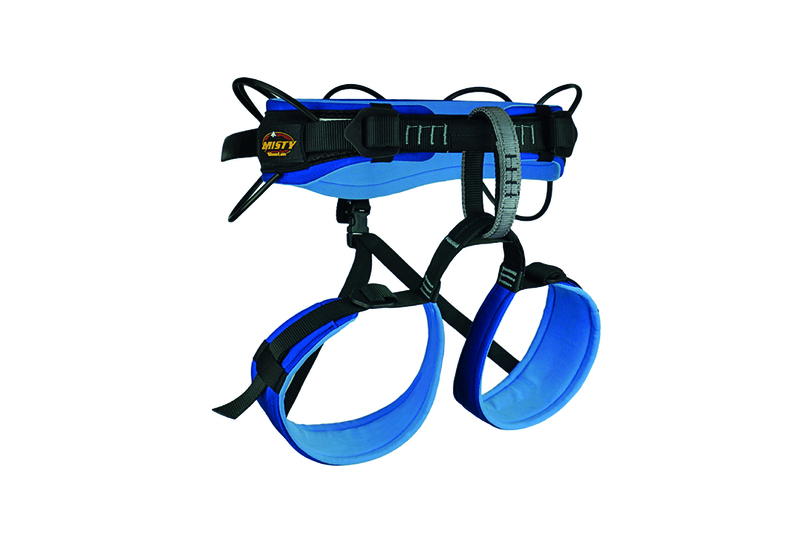 Nimble-fingered people will also find that the elastic straps can detach, letting you change pants or obey the call of nature while staying tied in to the harness. Harness durability is middling. After a summer of hard use, the leg-loop connecting strap has worn about half way through the protective covering. The abrasion looks like it was caused by nylon-on-nylon friction from rubbing against the belay/rappel loop, which has become prematurely fuzzy. Also, about two inches of non-structural stitching on the waist belt has come unstitched. The harness is probably good for another season, but two more might be a stretch. The Momentum comes in two sizes, XS to M (26- to 35-inch waist) and L to XL (30- to 42-inch waist). I have a 32-inch waist and the XS to M fit me just right.